If the Social Democrats win, it will be their first time to head a government in 16 years. 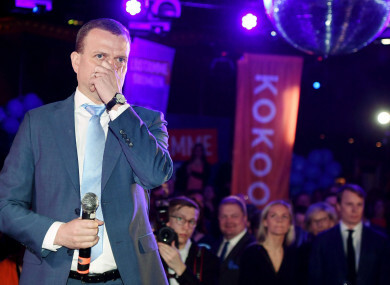 EARLY RESULTS IN Finland’s general election this evening showed the leftist Social Democrats in the lead, while the current prime minister said his Centre Party was the night’s “biggest loser”. The Social Democrats have 18.9% of votes after just under half (47.3%) of ballots have been counted, ahead of the conservative National Coalition at 16.6%. The Social Democrats, led by 56-year-old former trade union boss Antti Rinne, campaigned against the cost-cutting of Centre Party Prime Minister Juha Sipila and his finance minister Petteri Orpo, the leader of the conservative National Coalition Party. “For the first time in a long, long time the Social Democrats are in first place,” Rinne told reporters at the Finnish parliament. The right-wing Finns Party was almost neck-and-neck in third place with prime minister Sipila’s Centre Party at around 15%. The Finns Party, led by hardline MEP Jussi Halla-aho, has seen a surge in support in recent months during an anti-immigration dominated campaign, urging people to “Vote for some borders”. If the party remains in third place it could hold significant influence in the talks to form the next government, which in Finland is typically a coalition of three or four parties. Voter turnout looked set to come in around 72%, higher than the 70.1% who voted in 2015. The heated debate during the campaign over welfare, immigration and climate change led some analysts to predict that turnout would be high. The current government’s cuts to Finland’s education system, and a tightening of unemployment benefit criteria, provoked loud and widespread public opposition. Email “Finland election result: Prime minister's party is the 'biggest loser' as results come in”. Feedback on “Finland election result: Prime minister's party is the 'biggest loser' as results come in”.